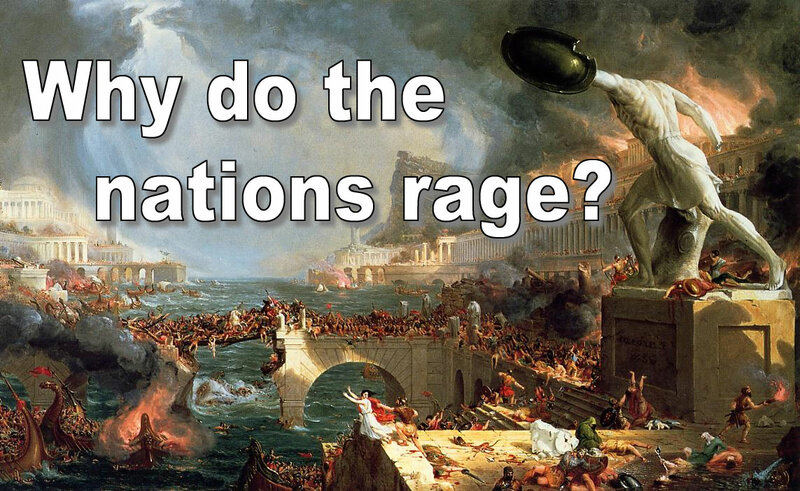 1 Why do the heathen rage, and the people imagine a vain thing? 2 The kings of the earth set themselves, and the rulers take counsel together, against the Lord, and against his anointed, saying, 3 Let us break their bands asunder, and cast away their cords from us. 4 He that sitteth in the heavens shall laugh: the Lord shall have them in derision. 5 Then shall he speak unto them in his wrath, and vex them in his sore displeasure. 6 Yet have I set my king upon my holy hill of Zion. 7 I will declare the decree: the Lord hath said unto me, Thou art my Son; this day have I begotten thee. 8 Ask of me, and I shall give thee the heathen for thine inheritance, and the uttermost parts of the earth for thy possession. 9 Thou shalt break them with a rod of iron; thou shalt dash them in pieces like a potter’s vessel. We’ve gone over aspects of this Psalm in previous articles, here, here, and here. This is our fourth installment and we’ll wrap things up with this one, looking at verses 10 through 12 to do so. We have arrived to the point in the Psalm where God’s incredible mercy is once again on display. Verse 10 opens with “Be wise now therefore, O ye kings...” God is offering a very direct, yet gentle warning about what the rulers of God’s earth need to do. God is telling these rulers to “be wise.” What does that mean? It means as my father would tell me during my growing up years, “Wise up!” In other words, actually focus on the truth of any situation and take up a position that is in line what that truth. I just took a defensive driving course, not because I had to, but because my insurance company offers a decent discount on auto insurance for individuals who take it. It’s strictly voluntary so I thought, why not? It’s always good to save money wherever I can so I signed up. It was an online course only and I was kind of dreading it a bit. I envisioned stale lectures and no interaction except at the end where I would have to take and pass a test. The fact that it would take me over five hours to complete it didn’t set too well with me either. However, as I went through the course, I was delighted to see how well the course itself was structured. They used several different narrators so you didn’t get used to one voice and begin tuning it out. They also interviewed people and had very well done animated visuals that showcased a teaching point. Moreover, I was thrilled to learn that I was doing quite a bit already that was considered to be good defensive driving technique. I learned also that there were things I could do better. During the course, I continually compared my driving skills and the things I do with the way things were presented on the screen. I could hear my dad’s words “wise up!” in several situations. It meant that in the face of danger, I should employ the best wisdom to keep myself from being involved in an accident. Wisdom should be part of every situation in our lives, especially in those situations where danger lurks. In verse 10, God is effectively telling rulers that they need to wise up. They need to use wisdom. From where does that wisdom come? From understanding the truth in any situation. If people understood and believed the truth about their need of a Savior, they would be more inclined to receive the salvation that comes only from Jesus’ life, death, and resurrection. If people understood the truth about the fact that the more they use cell phones while driving, the more apt they are to cause or be involved in an accident, which could take their life. God says to the rulers be wise. He says to the judges that they should be instructed. The truth here is that people too often fall for the many lies created and promoted by Satan. These lies are part of the very fabric of society and even in the best of times, they seem very difficult to circumvent or ignore. Too many are taken in by them. Just think of what is happening now in the political arena where there are actually people who believe Hillary is the lesser of the two evils between her and Trump because Trump was caught referring to part of the female anatomy in a derogatory way. People verbally attack other people over this trying to prove that Trump is by far the worst candidate possible for the Oval Office. These same people forget all of the affairs of Bill Clinton and how he was actually impeached because of them (though he remained in office). To these people, Hillary is the one to be president therefore it becomes extremely easy to ignore all of the problems with her and her husband. In reality, neither Trump or Hillary are best suited to the Oval Office, but it has come down to the two of them, so who is better? Certainly, it would appear that Trump is the lesser of both evils and you can be sure that if there was even a true hint of criminality in Trump’s camp, it would be splashed all over the news 24/7/365. Again though, those who boldly support Hillary ignore all of the suggestions and charges of criminality where she is concerned because she keeps dodging all of it. They point to FBI Director Comey’s testimony and ignore the fact that he is on the Clinton Foundation executive board. They do not even see a hint of collusion there. Truth is very difficult to come by in today’s society. It really is up for grabs and most adopt some perceived truth that is not truth at all. Psalm 2 speaks to this problem that unfolds the closer we get to the physical return of our Lord and Savior. But in spite of this, God speaks a warning that these rulers and judges should be wise. Clearly, God would not warn them to do this if actual truth was impossible to ascertain. In their heart of hearts, truth – absolute truth – is there, but the kings and judges (along with each and every individual person), must be willing to look for it and acknowledge it when they find it. Verse 11 provides the opposing position to verses 1 through 3. Instead of doing everything in their power to throw off God’s sovereignty (an impossibility! ), these rulers and judges should “Serve the Lord with fear, and rejoice with trembling.” In order to do that, humility is required and that will only come to those who seek absolute truth. Truth is what engenders humility within a person if it does not harden their hearts. A person who willingly serves the Lord will also submit to Him, their will for His. This is the reality that will be life on this planet when Jesus returns and is installed on Zion, God’s holy hill in all the earth. From that place, Jesus will reign perfectly, but unfortunately, with a rod of iron because pride will still tend to swell the human breast. Verse 12 speaks to the way life will be during the Millennial Kingdom and ends with the generalized statement for all who trust Him throughout all of human history. During the Millennial Kingdom, there will still be problems and issues that need to be settled (implied in the text). We’ve touched on that in previous parts of this series. Not all will be perfect because the sin nature will still exist in people who lived through the coming Tribulation/Great Tribulation and people who are born as well even during the Millennial Kingdom. Every human being born into this world is born with a sin nature that predisposes all of us to rebel against God. The very fact that we are born with it pits us against God and we are literally enemies to Him. He has done everything He can to offer a way for us to reconcile with God (He does not need to reconcile to us). Salvation is received by those who place their trust in Him. It will be the same way for those born during the Millennial Kingdom. They will need to come to terms with their own sin nature and the fact that it has made them enemies with God. But even those who have salvation but have not died will still do and say things that are offensive to God. Even then some will become obstinate. But a humble person is a person who sees their mistakes and quickly confesses, once again confirming their allegiance to the Lord who paid it all (v. 12). Once they do this, they will not perish along the way. Of course, this also includes people who are alive during the Millennial Kingdom who do not receive salvation and do things that are sinful and do not confess and repent of those things. There certainly may be times when Jesus will have to deal with it in what will appear to be a rather harsh way in order to maintain peace. Korah’s rebellion spoken of in Numbers 16 is a case in point. These individuals essentially rebelled against God’s man, Moses. God without any doubt told the Israelites whom He was behind and it was not Korah or those who sided with him. Their punishment came swiftly and permanently. This will likely be the way Jesus has to deal with some individuals during the coming Millennial Kingdom. In fact, at the very end of that 1,000-year period, led by Satan, a tremendous rebellion against God in Christ is mounted. It is extremely short-lived with fire coming from heaven to devour Satan and those who follow him. Psalm 2 is a dire warning for all who believe they can “overthrow” God and come out from under His sovereignty. While they are free to do things like reject Him, His plan of redemption, and live their own lives the way they want to live them, this does not in any way, shape, or form, impinge upon God or His sovereignty. It does not take away from it at all. It simply puts those individuals at odds with God and whether He deals with them now or later, He will deal with them and their rebelliousness. Moreover, we also need to keep in mind that God promises that every single individual will bow at the Name of Jesus. For it is written, As I live, saith the Lord, every knee shall bow to me, and every tongue shall confess to God (Romans 14:11). You see that word “every” in the middle of that declaration? It literally means every person or created being, from Satan to Michael the Archangel. The only difference is that most will be forced to bend the knee and admit that God is fully sovereign. Only some (authentic Christians and the elect angels of God), will be the ones who do so willingly. So one day, Satan himself will kneel, bow, and confess that God is Supreme over all His Creation. They will actually praise Him, whether they want to or not. God will have His way. Certainly the best thing everyone can do is turn to Him in humility, receive His salvation, and live willingly under His Lordship. It’s way too late for Satan and his angels, but as long as people have breath, it is not too late for them. For human beings alive today, salvation can be received now, while it is still today (Hebrews 3:13). Entry filed under: Agenda 21, Atheism and religion, christianity, eternity, Global Elite, Life in America, Political Correctness, Politically Correct, Politics, Pretribulational Rapture, rapture, Religious - Christian - End Times, Religious - Christian - Prophecy, Religious - Christian - Theology, salvation, temple mount. Tags: god the son, millennial kingdom, millennium, psalm 2, zion.